The BHS line of Utility, Service, and Material Carts provides more efficient, safer material handling for specialized applications. All-steel Utility & Service Carts (USC) roll smoothly and easily even when fully loaded, reducing the force workers must exert for travel. This lowers the ergonomic risks of manual material handling. 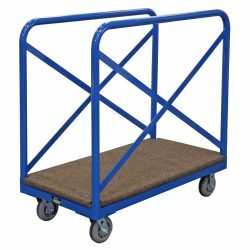 These Carts are ideal for order picking, janitorial equipment, manufacturing components, and any task that requires the movement of bulk materials. Panel Carts (PC) are ideal for transporting sheets and panels of material such as drywall, plywood, folding tables, office cubicle partitions, and rolled goods. All five models have a 1,000-pound capacity and are made of heavy-duty steel. BHS Panel Carts feature a steel frame with a carpeted deck. This combination gives the cart a rugged durability, while preventing scratching and abrasions to materials. The Panel Cart securely transports materials ensuring that your product safely reaches its destination. The Platform Truck (PFT) offers a unique combination of flexibility and easy-rolling comfort for staff. To learn more about these material handling solutions, or to discuss a custom-designed Material Cart, call BHS at 1.800.BHS.9500.